You asked: How do voters impact policy? If I don’t think about politics, or read the newspapers, or go out to vote, and I don’t get involved 'politically' at all, but I work really hard for a living— isn't that enough? In this VERY BASIC AND SIMPLIFIED post, we will try to unpack your relationship with corporations and your government, and therefore your identity as both consumer and Malaysian citizen. The government gets to decide on various things, draw up a budget to allocate our money (taxes and revenue) for government programmes, make a plan for the next five years, decide on new laws, amend old ones. So the leader of the winning coalition / party forms a cabinet of MPs made up of their own candidates (they declare a win to the Agong first). The MPs that are chosen for Ministers now get their own portfolios, eg. Education Ministry, Transport Ministry, and they form the Cabinet. Did you know: If there aren’t enough qualified candidates from the seats won, the PM can appoint ANYONE qualified to be a senator and then make them a Cabinet Minister! No elections or permission from the public needed. Building the cabinet of Ministers also means building a Ministry list. For example, we used to have a Ministry of Tourism and a Ministry of Arts, Culture, and Heritage, but today we have one Ministry of Tourism and Culture. A full Malaysian Ministry list of inactive and active portfolios can be found here. When the PM announces a budget yearly, every Ministry gets a cut of that money to improve their ‘field’ in the country. So the Ministry of Education gets money to improve the nation’s education, the Ministry of Transport gets money to improve our roads and travel, and so on. For each Ministry to do their jobs well, they need to put out a call for tenders and hire worthy companies to execute their plans. For example, the Ministry of Transport will hire companies to run the tolls on our highways. It’s easy then to think that this is all Ministers do. But at the end of the day they’re still MPs. Priority-setting and lawmaking is the job of the parliament. That’s why we call them lawmakers. An MP’s main job is to enact, abolish, or amend laws. This is where the person you vote for gets a huge say in our future. These laws they make affect us all. And when they’re made, we’re supposed to be consulted— namely people most affected by the particular law. So if you want to amend the Child Rights Act, you should consult associations of teachers, parents, child rights groups, women’s rights groups, and the Bar Council. If you want to make a law about the Internet, you should consult telcos, internet rights activists, academics, online collectives, social influencers, the youth. After all, these groups and collectives already work closely with their communities and know them well, so it’s easy for them to represent collective demands and concerns to lawmakers. To make a good law, you actually need to interact with the public. Technically, everyone wins when you do. A new law is likely to benefit citizens, and lawmakers benefit from the work of collectives because consulting everyone would be impossible. CONSULTING THE CITIZENS IS THE IDEAL, of course. The truth in Malaysia is that it’s more likely that industry leaders and ‘major players’ are the ones consulted by the government instead of, say, community town hall meetings. 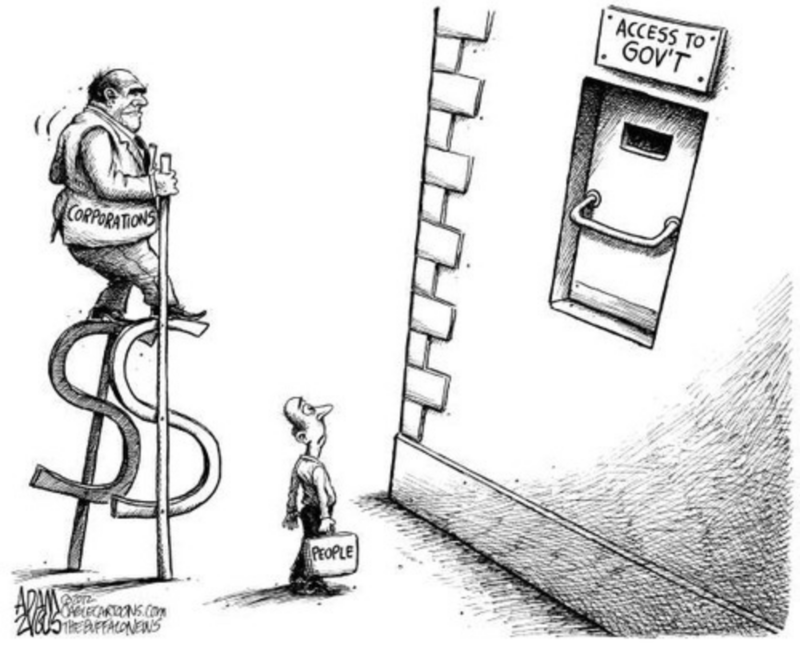 In other words, corporations (and the people who run them) tend to end up having better access to lawmakers than we do. What’s interesting here is that we probably feel like we have more access to corporations, brands, and businesses than we do to our civil servant politicians. This is especially true for young Malaysians! There is some sense in young Malaysians that businesses and brands will listen to us all year round, and politicians won't. We all know that companies and agencies seek the youth demographic’s attention because of our influence on culture, discourse, and disposable income. If you’re 21-30, ask yourself: Do you feel more more ‘heard / seen’ by corporations or your own government? If what we paid for doesn’t go down well, if a brand’s behaviour turns us off from giving them our money, we put them on blast and make them listen, kan? The problem here though is that even if corporations listen to you and take action, it’s not really a win for you— it’s a win for them. All businesses are oriented to profit. As clients, we have some say in it, but— since they’re actually accountable to shareholders and not us— our real impact is limited. No business is as invested as you are in making the world you want unless it profits them too. Yet don’t we tend to expect more from corporations than we do from our government? We’re encouraged to have faith in being consumers, not citizens. This means we’re more likely to believe those we don’t/can’t elect, who are not accountable to us, and whose actions will always be about profiting from us. The truth: it’s the government that is accountable to us, by default, all year round. They are citizens we elect to represent us and create laws, enact legislation and structures that shape our homeland. Many of these policies directly impact how corporations should act with us, like how well they treat their staff, or how much they pollute our environment. So let's go back to the earlier question. Many of us excuse ourselves from owning our citizenship because we prioritise what pays the bills. Think of the question in the beginning: If I work really hard, isn't that enough? So let’s unpack why working hard isn’t enough. A lot of us work hard because we want to save up and afford stuff we desire. It becomes our full-time concern, saving up for marriage, kids, a car, an iPhone. Who has time for politics? But working hard just makes you a good consumer. Beyond that, we also work to save money for non-consumer reasons, eg. when we need medical attention. How much *should* it cost? There are things that will impact how much money you can earn, or save, what taxes you need to pay, what public transport is being developed, how much your student loan is. And you could work to the bone and still not be able to change these things, or afford them, because ‘working hard’ has no effect over how those things are already priced. ‘Working hard’ isn’t going to change anything about the reality of GST or PTPTN or your tax impact. It’s time for us to expand our definition of ‘good Malaysian’ into more than just being all about the economy, but being a good citizen too. Being a citizen of a country means that its laws impact all your decisions— which hospital to go to, which school to send your kid to, how much funding is accessible to you. Those are decisions made by people you vote into power, and their job is to listen to you and help create the country you want to belong to. They make laws and policies for yourself, your neighbourhood, your loved ones, your environment. When they listen to us, we have a country we can be proud of. When we choose not to register or not to vote, we choose not to use the power we already have to elect citizens who get to make these policies, and hold them accountable in running our country. Add that to how corporations have better access and influence with lawmakers than we do, and years and years of giving up our power to focus on our jobs— the distance between us and our government becomes more and more real. We no longer expect to be heard, we are expected to listen. This isn’t a power we should be surrendering to corporations, especially when they have better access and influence to lawmakers than you do. When we give up this power to focus on our jobs, the illusion of our powerlessness is only amplified. This is why our youth apathy works against us. Apathy involves doing nothing politically and feeling everything will be fine economically. But there is no policy level you magically unlock after working really hard, no automatic policy change when your effort gets you thousands of followers on Instagram. Sure we should be voting every 4-5 years, but in between then we also need to be engaging with anything that impacts the locality we live in. Democracy is being concerned about laws that impact the internet, our choices in service providers, or companies who get awarded bandwidth to run a radio station or our toll booths. Democracy is making sure that the people we elect into parliament are transparent and consult us before making huge decisions in our best interests. When we give our democracy away, decisions to design Malaysia will be made in the best interest of corporations, politicians or both— people who talk without us there because we’re made to feel too powerless to join the conversation. How else do companies get contracts to work in areas they have little experience in? It doesn’t stop with the vote ballot every 4-5 years. In fact, marking an X is the bare minimum you can do to engage with democracy, yet still cause a significant impact. The least you can do is to choose a candidate you feel will give the best results towards the Malaysia you want more of.